Fish. It's fish week. Ugh. Not every day, but three days this week are fish days. How to cope with fish days? This: A Whiskey Collins. Complete with Mickey Mouse straw and skewered cherry. 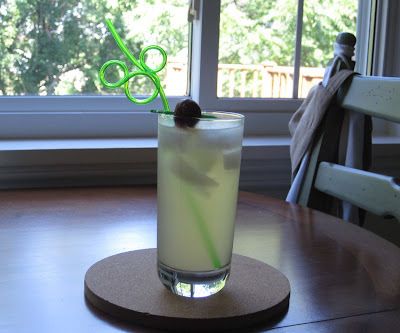 The cocktail is juice from half a lemon, 1 tsp powdered sugar, 2 oz whiskey, ice cubes, and club soda. Back to the fish. I know, I know, it's good for me. Omega 3 and all that. I just don't enjoy it. When I entered the kitchen and SP was unwrapping the salmon, I started gagging from the smell and had to leave. I do not like seafood smell. It disgusts me and makes me feel sick and like I'm going to puke. SP tells me this is the fresh, wild sockeye salmon, which cost less than the farmed frozen salmon at Costco last weekend. All I know is, it's fish. And it made the kitchen stink. Another way to cope with fish: slather it in a sauce. 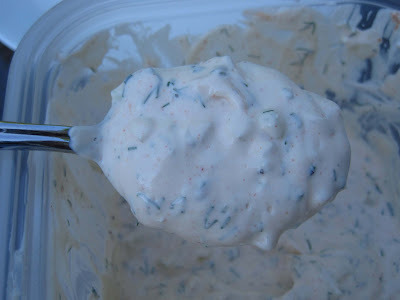 In this case, a Cucumber Dill Tartar Sauce. I found this recipe in one of the Penzey's catalogs we got, next to a recipe for Tuscan Tilapia. 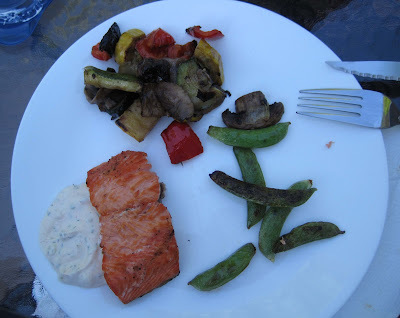 But I figured it'd be good on salmon, too - plus we had fresh dill from the CSA. It's not really a tartar sauce - there's no relish or lemon juice or ingredient like that. It's yogurt, mayo, and sour cream with dill, chives, paprika, pepper, and cucumber. This sauce is so good! Oh my gosh - I think I could eat spoonfuls of it. It might be good as a veggie dip. 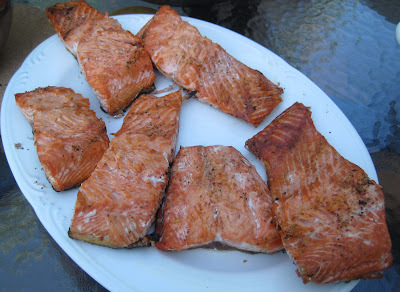 It definitely helped me enjoy the grilled salmon, which, truthfully, wasn't so bad. With our grilled salmon, we enjoyed some grilled CSA kale: Metal bowls aren't great for photos, but they are light and easy to carry onto the deck! You can see crystals of the Dos Anclas salt we sprinkled on the kale. We also cleaned out the veggie drawer! 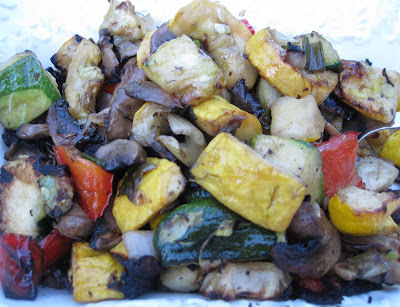 There were lots of CSA veggies and we chopped and grilled the patty pans, zucchini, fennel, candy onion and we used up some red peppers and mushrooms from the shish kebab. I love grilled veggies. 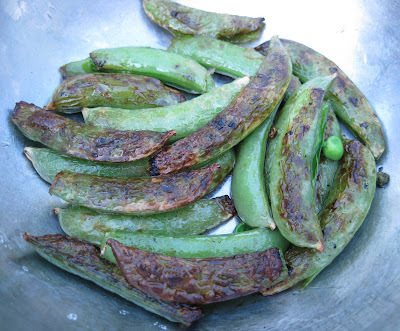 SP also sauteed the CSA peas in a skillet on the grill burner. Yum! Such a healthy meal. Lots of veggies and fish. 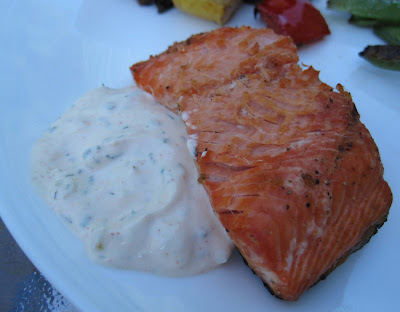 The sauce is maybe not so healthy, but it is very summery and tasty and if you're like me and cannot handle plain fish, I urge you to try this sauce. On tilapia, salmon, sole, flounder - I'm pretty sure it'll make any fish tastier! Combine ingredients. 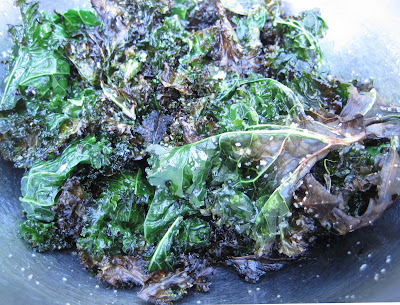 Refrigerate for at least half an hour. Allow to come to room temperature before serving.